Yoder Smokers Community Forum • View topic - Smoke, A Subjective "Flavor"
Smoke is a collection of tiny solid, liquid and gas particles. Although smoke can contain hundreds of different chemicals and fumes, visible smoke is mostly carbon (soot), tar, oils and ash. Smoke occurs when there is incomplete combustion (not enough oxygen to burn the fuel completely). In complete combustion, everything is burned, producing just water and carbon dioxide. When incomplete combustion occurs, not everything is burned. Smoke is a collection of these tiny unburned particles. Each particle is too small to see with your eyes, but when they come together, you see them as smoke. - minerals in the tree’s cells, like calcium, potassium and magnesium (which are non-burnable and become ash). When you put wood on a hot fire, the smoke you see is the volatile organic compounds (hydrocarbons) evaporating from the wood. They start to evaporate at about 149°C (300°F). If the fire is hot enough, the hydrocarbons will burst into flames. Once they burn, there is no smoke because the hydrocarbons are turned into water and carbon dioxide. After the fire has been burning for a while, most of the hydrocarbons (gases and smoke particles) have been released, and all that is left is charcoal, which is almost pure carbon with some minerals. The hot charcoal slowly burns with a red glow. There are no flames because charcoal will only produce carbon dioxide, which cannot be burned any further, unlike other vapours. Very little smoke is produced at this stage. The quicker a fire is reduced to glowing charcoal, the hotter it will be and the less smoke it will produce. The carbon combines with oxygen to produce carbon dioxide until all that is left at the end of the fire is the ash – the minerals. So from this we can ascertain that if a fire is just starting, the material burning is wet, the fire has a lack of oxygen, or there is an absence of flame, etc., the smoke will be heavy, thick, opaque and full of unburned solids. Also, when using charcoal alone, there will not be any smoke "flavor". If the fire is efficient, has plenty of oxygen, the material is dry, there is flame, etc., there will be very little smoke or unburned solids. The smoke you see from this type of fire, if you see it at all, will be transparent and bluish in color. No matter the resultant type of smoke coming from a fire, when food is cooked in an environment where the smoke is present, solids in the smoke will be deposited on the surface of the food, giving the food "flavor". This is where the subjective debate of smoke "flavor" comes into play, as every person has their own taste likes and dislikes, which comes directly from the quality of the smoke and the amount of unburned solids deposited on the food during cooking. There is not right or wrong as far as taste is concerned, but there is somewhat of a "standard" for BBQ smokers, which is to achieve the transparent, bluish smoke. With offset cookers that burn wood, the fire and fire management are completely in the hands of the cook or fire tender. There are many variables in the process, i.e., type of wood, dryness of the wood, is there bark on the wood, ambient temperature, environmental airflow (wind), fire tender's experience, etc. In other words, the cook, or fire tender, has complete control over all of the variables and can achieve either desirable or undesirable smoke, or somewhere in between, to achieve the desired smoke "flavor" on the end product. 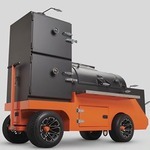 Yoder Smokers offset cookers were designed to be very efficient and, using the proper procedures, will provide the cleanest burning fire, producing the most transparent, bluish smoke, but, achieving this is entirely in the hands of the cook or fire tender. Pellet cookers are much different in how the fire is tended, as they are electronically controlled. Some have a "smoke" setting that allows for the creation of the "bad" smoke at the beginning of the cook, which will deposit lots of unburned solids on the food to "flavor" it. Others are super efficient, burning very little fuel (wood pellets), and burning so cleanly that no smoke is present to "flavor" the food. Yoder Smokers pellet cookers were all designed to automically produce the exact smoke output as a Yoder Smokers offset cooker, running a perfectly managed fire. This smoke will be very transparent, and bluish in color, but, unlike in a Yoder Smokers offset, the Yoder Smokers pellet cooker can not be modified to produce "bad" smoke, as the pellet cookers are all run electronically. So, what if the smoke "flavor" is not subjectively what you are wanting from a Yoder Smokers pellet cooker? Changing to a different brand, or flavor of pellet might help, but in reality, in blind testing, no one can actually tell what flavor of pellet the food was cooked with. The smell of the wood burning is distinctive, but the resultant "flavor" is not. The Yoder is the exception to the rule when it comes to smoke production. I can see guys using a Tube for cold smoking, but not at cooking temps. Good quality pellets is usually the difference between good smoke and bad smoke. I find that some pellets produce more ash and creosote than most other pellets. There are a few other brands that have higher moisture content. They use scrap lumber, store it outside and do not have a dryer to reduce the moisture content. Some of these lesser grade pellets can be upwards of 12%-14% moisture, while the better brands are around 6%-8% moisture.